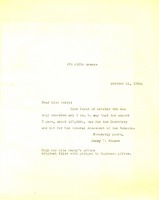 Mary writes to Martha with a donation to rebuild the burnt dorm. 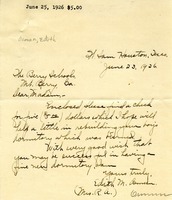 Edward writes to Martha with a donation to help rebuild the burnt dorm at Berry. 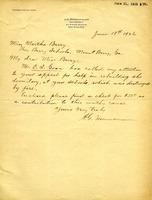 Edith M. Osmun writes with a donation to go towards the rebuilding of the dormitory that had been burned. 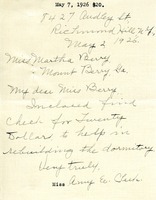 Martha writes to Miss Greenwood to thank her for the gift to Berry for the dormitory rebuild. In response to a plea for help after a dormitory fire, Christina G. Kelley express her condolences and explains that, at the moment, she has very limited funds. She will, however, send what she can and encourage others to do the same. 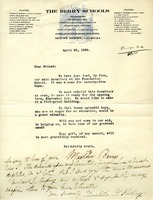 Miss Clark sends a check for $20 to help towards the rebuilding of the dormitory lost by fire.